We love our sponsors, who donate cash, auction and raffle goods, advertising, food, activities, and much, much more. Rally sponsors allow us to donate generously to JDRF in order to find a cure for Type 1 diabetes. Rally Sponsors, we SALUTE you! Rambler Dan: Friend of the Rumble and mad scientist behind the gymkhana. Dan not only created the course, but he donated all of the time and materials to build it. Dan is also donating some pretty cool prizes. Thank you Dan! After practicing OB/GYN for almost 35 years and delivering and raising her own three children, Dr. Bruce feels very comfortable with the family-focused culture of the Capital Region. Dr. David Ray is an attending physician treating patients with HIV and AIDS at Albany Med, a NYS Department of Health-designated regional AIDS Treatment Center. Our goal is to provide a comfortable, convenient, and pain-free dental experience. Patients can expect a low-pressure environment where we will take the time to listen and establish treatment plans that meet your individual needs. Our staff is experienced and friendly and we truly enjoy making our patients comfortable and healthy. Please call and see how we can help. Ronnie’s Motor Sports of Guilderland, N.Y., is a premier superstore of pre-owned motorcyles, ATVs and snowmobiles. Need service? Click here or call Jim at 518-389-2370 to schedule your appointment today. We offer pick-up and delivery service. For 75 years Crisafulli Bros. has provided plumbing, heating, and air conditioning design, installation, service, and scheduled maintenance to our residential and commercial clientele. T.M. Byxbee Co. is a nationally recognized accounting firm. By maintaining their focus on client service, Byxbee has grown and employs a host of professionals and support staff to make sure customers receive the highest level of attention. Since 1999 The Other Company Restaurant has been bringing you only the finest, freshest foods. Sharon, Ellen, and the rest of their friendly staff are dedicated to making your dining experience a pleasant one. 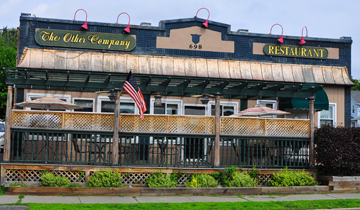 Whether it’s a fluffy omelet, a stack of pancakes, corned beef Reuben, or a roast beef club, there’s something for everyone at the Other Company Restaurant. Scooterwest is your one-stop scooter shop specializing in Vespa lifestyle and apparel, modern Vespa parts, vintage Vespa parts, Piaggio scooters parts, Genuine scooter parts and accessories, Kymco scooters, Universal hardware and related items, scooter memorabilia, tires, Honda scooters, Suzuki scooters, and more. Shipping available worldwide. Pirate Upholstery specializes in designing and crafting high-quality custom motorcycle seats and leather craft. We cater to the novice industry with custom seats and modifying existing seats while also being trusted by industry icons Orange County Choppers, Paul Jr. Designs, and V Force Customs with crafting seats for their theme bikes. Based in Kingston, N.Y., our family-owned company, led by master artisan Jay Teske, is prepared to work with you on any leather-related motorcycle or scooter project. Visit our services and photos pages to view our work then contact us at info@pirateupholstery.com to discuss your project and to receive your free quote. Cheeky Seats, where scooters and fabric unite to create something beautiful, useful, and expressive. Offering hand-tailored scooter seat covers and scooter accoutrements made to order, in a cottage studio in Pennsylvania. Poppy’s Place has been serving Menands for over three decades, our family continues to bring the kind of adoration that has made our customers loyal, and kept us the neighborhood favorite.